Most productions need the addition of sound effects (SFX), and often music, to enhance the action on the stage. A sound person selects, records and plays back these effects under the guidance of the director of the play. Music is important to set a mood or highlight a transition in the action, whereas sound effects emphasise an action sequence or support what is happening on stage. There is a wealth of pre-recorded sound effects readily available on CD and the internet. Often several of these are combined into one composite effect. However, occasionally it is necessary to construct a specific ‘tailor made’ set of sounds using our own recording facilities. For example, to reproduce the sound of Nazi troopers arresting one character, we took over an old house and recorded half a dozen people running up and down the stairs shouting “Raus Raus”. Some productions also need incidental music either to introduce a scene or as part of the action. 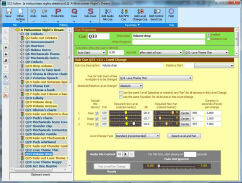 We use the Show Cue software system for the production and playback of sound effects. The software provides comprehensive facilities for assembling complicated sound effects and their subsequent cueing into the production. 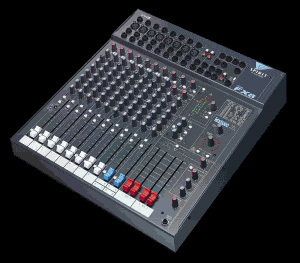 Using our Spirit mixing and effects desk, we can also add echo, reverberation and other effects at this time. The sound is then amplified and heard through a variety of speakers, which are placed around the hall. All this is happening generally within sight of the action but hidden from the view of the audience. All the equipment is easy to use and accessible. Instruction manuals are close to hand, and advice, assistance and guidance from our experienced sound team is always available for anyone keen to help out with SFX.